Without planning it, Mr. Iknead and I have four photos that are practically identical, one with each of our grands on the day they were born. Whenever I see these pictures, I fall in love with him all over again. Beautiful mom, beautiful big sister, beautiful baby. Our son and his new daughter. Etched Rio Wrap! TA DA! I love it – it’s the perfect weight (not too hot, not too cool), the perfect color (love caramel), it stays put (not falling off one of my narrow to the point of almost nonexistent shoulders or the other) and the drape (OMG). After some initial misbehavior on the yarn’s part, we came to an understanding and this project truly became a labor of love. After reading a post on uknit2, I decided to document my stash status and share a little of it here. At the moment, it’s relatively neat and more or less organized, sock yarn, sport weight, lace weight, bulky, you get it, you’re a knitter but the more I looked the more odd I thought part of my stash was. Here, you be the judge. Actually, come to think of it, it’s not odd at all that I hoard ziplocs and shopping bags. After all, fiberphiles use more ziplocs than anyone else on the planet and for your safety, don’t get between me and a nice, heavy, handled shopping bag. I won’t pretend to speak for other crafty types, I’m trying to stick with what I know – but no, it’s not odd at all, it’s more than a little smart, green and best of all, frees up more bucks for my fiber fixation. So, strike the odd. Smarter than the average bear, us fiberphiles. I rest my totally turned around case. Not yet, kneading takes more than a little energy and I’m still promising Mr. Iknead to take it easy, but soon, very soon there will be fresh bread. I knead it (get it?)! I know, I love a corny play on words. Fly by Tami Amis for more FO Friday treats – you’ll be glad you did! FLASH – Bigmommy and the babies are in town and are headed over!! Pics and report tomorrow! Yay, getting a little lonesome! Nothing, absolutely nothing. Sitting here, waiting for the electricians to arrive to finish work so I decided to use the time constructively, blogging. Today is Old People Day at the grocery store, so at some point I’m going for groceries when I can get the Old Person Discount. Jeez, that’s something I never thought I’d say. I guess I thought that when I reached a certain age (never determined), time would stop and I’d be that never determined age forever. However, it hasn’t stopped and I haven’t stopped either, 55 years old at last check. Young at heart, that would be me. I started a new project yesterday, from a book I received as a gift last year, which I’d misplaced a couple of months ago. The book is Boutique Knits 20+ Must-Have Accessories. I started the Sideways Grande Hat, using yarn that I repurposed from an infinity scarf which was much, much too long and heavy. I think it’s Cascade 220 but I’m not sure. I just love the mauvey, heathery color and its softness. It’s a little more on the pink side in real life. 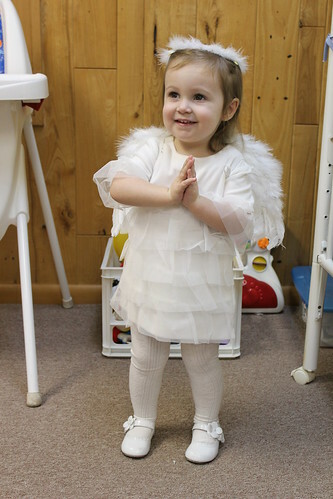 Annabelle aka Babysis is set to be baptized next Sunday, 01/13/13 and I’m planning to stay an extra couple of days. Looking forward to giving Bigmommy a hand for a while. Babysis isn’t a great sleeper, so she and Bigdaddy aren’t getting as much sleep as they would like. Poor Babysis being compared to the Papoose, who slept through the night at six weeks and is still a great sleeper. Babysis is only three months old, so I expect that here pretty soon she’ll start sleeping longer and longer through the night and everyone’s attitude will get better. At least she’s not colicky! 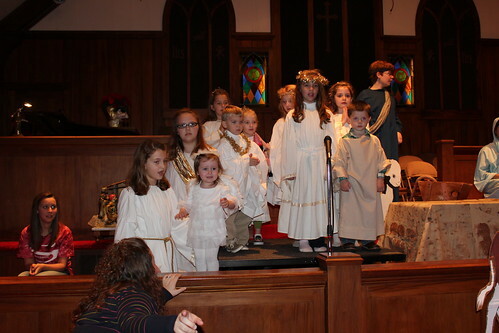 The Papoose and Babysis were in their first Christmas pageant on Wednesday evening. 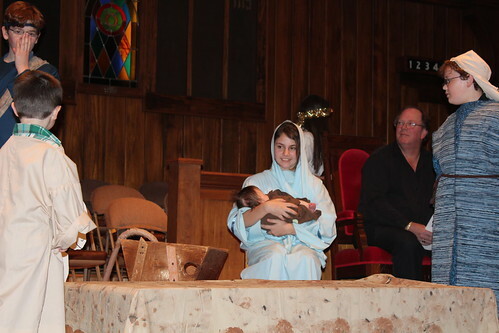 The Papoose was an angel (no surprise there) and Babysis stepped up as the Baby Jesus. The sweetest things ever! 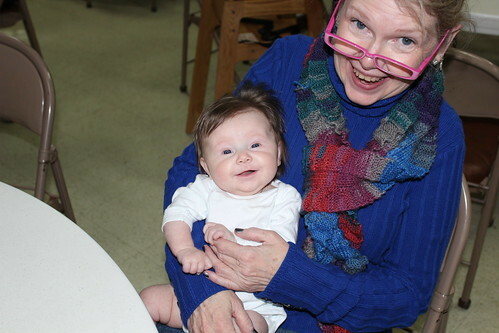 We did have a tiny bump in the performance when Angel Papoose turned around, saw the audience and immediately had a small meltdown, crying very pitiously until Bigmommy took her down from the stage and she came to sit (on the front row of course) with Grandmary, Pops, Pawpaw and me. Best. Angel. Ever. Two seconds and counting down pre-meltdown! Babysis rocked it out as the Baby Jesus, sleeping through the whole thing and being all the more precious because of it. It flies. The holidays are nearly upon us and it feels (at least to me) like we just wrapped up Christmas 2011 a week or so ago, relaxing and telling each other that “this was the best Christmas ever”. We’ll say it again in about a week, vowing that nothing could top Christmas 2012, what with two babies on their first Christmas and one who’s just getting the hang of presents and Santa. The wonder never leaves me, I’m blessed. It’s WIP Wednesday and here’s the beginning of the Bauble shawl I’ve been going on about, with only one false start. Oh gosh, hope I didn’t jinx it. It’s going to be lovely, I can tell already. The yarn (if I hadn’t already mentioned it) is Cascade Yarns Heritage Silk Paint, 85% Merino Superwash Wool and 15% Mulberry Silk, color number 9801. Since it has only a number, not a color name, I think I’ll call it Bonfire. That’s what the colors make me think of. I think everything should have an actual name and Bonfire fits. My treadmill book is The Last Romanov by Dora LevyMossanen, which is awesome even if you’re not obsessed with the whole Romanov/is Anastasia still alive mystery. This book grabbed me and pulled me into it, to the point that I’m actually walking longer than usual, just because I have to know what happens next. Love it. Last weekend we had a couple of days of cooler (relatively speaking) weather and so I satisfied my need to bake with a carrot cake for Mr. Iknead, which technically was an anniversary gift since last Friday, 09/01/12, marked our 33rd wedding anniversary. Long time and we still like each other. A funny about the cake – now, Mr. Iknead doesn’t have a real discerning palate when it comes to certain things; so, I’m grating carrots, mixing and sifting for the cake and he says to me, “Could you put the good kind of cream cheese icing on it, you know, the kind that comes in a can?” Cracked me up. We call that keepin’ it real.